There are two schools of thought when it comes to securing firearms. The first is to lock them up, and the second is to find a means to hide them. Both have their strengths and weaknesses, and unfortunately, binary thinking has limited us in options for both hiding and securing firearms. Part of the appeal, at least to me, is the secretive nature of hidden and disguised gun safes. Hidden gun safes range from built-in wall units to plain looking furniture, and more traditional safes designed to be stored in hard to see areas. Being able to store a gun behind a mirror in my living room makes me feel like an American James Bond. Is the American James Bond Jason Bourne or Jack Bauer? And why do all these guys have the initials J.B.? Anyway, today we are going to discuss the advantages of hidden guns safes, the types, and the reason for having just one is a good idea. The thing about criminals is that safes draw them in. 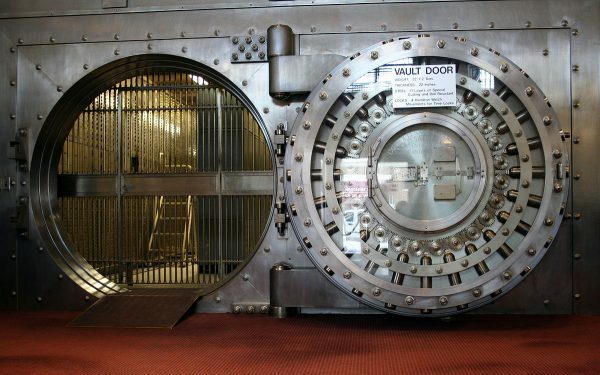 More than anything, a nice safe is sure to contain treasures a criminals would love to get his hands on. With enough time and the right tools, no safe is uncrackable. This is where a hidden or a camouflaged gun safe comes in. Thieves may be able to crack a safe, but only if they can find it. A nice sized metal safe is pretty easy to find. A safe built into the wall behind a mirror? Not so easy. Being discrete means being smart. A hidden gun safe is smart, and a big metal gun safe is brutish. Both have their place, and, as I used to tell my Marines, you can be strong or you can be smart. 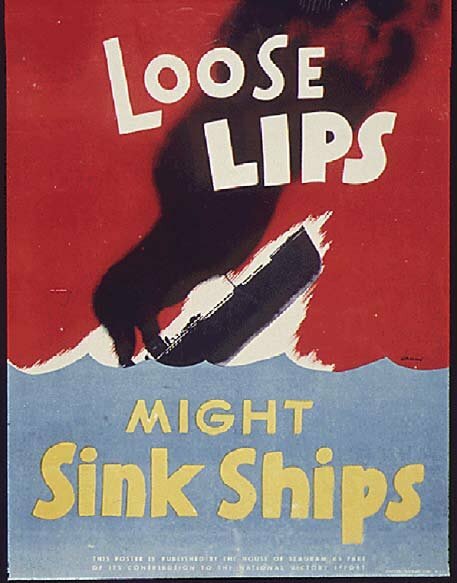 In some situations, a large and capable safe may not be possible. For example, if you live in an apartment several stories above the ground floor, you may not be even allowed to have a safe due to weight restrictions. Hidden safes tend to be small and lightweight. If your coffee table is housing a Mossberg 590A1 loaded with 8 shots of Federal Flitecontrol buckshot, you have an immediate bad guy cure. If your door is getting kicked in, you want to be able to respond with extreme prejudice right? 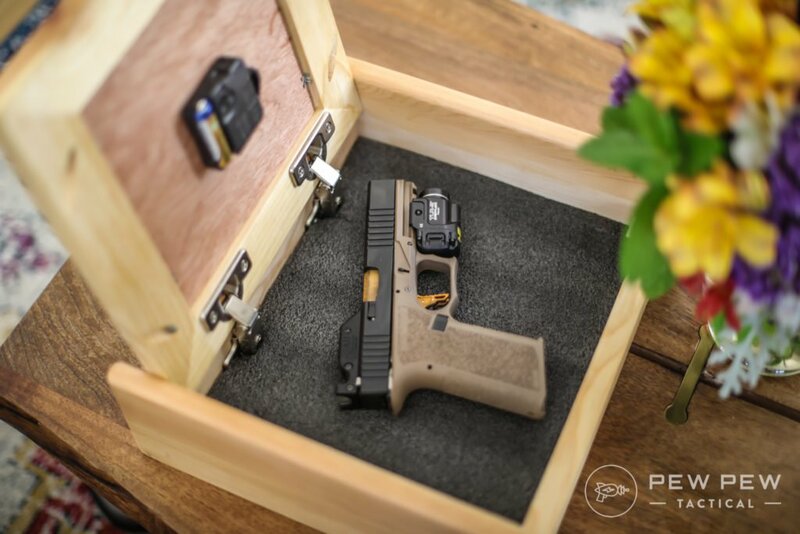 A wide variety of hidden gun safes are designed to look like ordinary pieces of household furniture so that they can be stored in plain sight without a second look from guests or criminals. This also gives you the ability to surreptitiously place firearm storage throughout your home. If you have the funds and the will you could be in arm’s reach of a firearm, ready for home invaders, zombies, or SPECTRE. When you place multiple hidden safes in our home, you are increasing the chances of one of them being found. I mean, it’s a pretty basic probability that a house with ten hidden safes is more likely to have one found that a house with 1 hidden gun safe. But the trade-off is pretty good. Sure, ten safes are easier to find that one, but having one safe with all of your firearms accessed is far more of a problem than having one safe with about a tenth of your firearms accessed. Plus, by ensuring that safes are well hidden or disguised one can minimize the chance of a safe being found, and by ensuring safes are plenty secure one can minimize the risk posed if one is discovered. Hidden gun safes are great, they are a clever way to secure your firearms and have them ready at a moment’s notice. That doesn’t mean there aren’t also a few disadvantages to be aware of. Most of these hidden gun safes are not fireproof. A coffee table that hides guns is still just a coffee table. This is something to keep in mind, and probably means you should have some form of insurance on your guns. 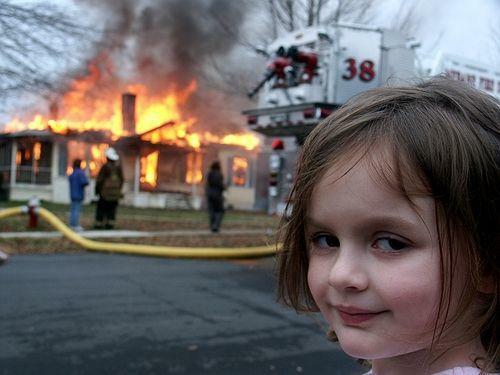 Disaster Girl knows what I’m talking about. A good safe (read big, heavy and expensive) that’s hard to crack is going to keep a lot of criminals out. They understand they may not have the time to fully crack the safe and move on smashing and grabbing as they go. If the thief is smashing and grabbing and happens to break your desk, a clock, or a coffee table holding a gun that gun is gone. It wouldn’t take much more than a hammer to break into most of these safes. If they simply discover a locked hidden safe they may just take the whole thing with them. OPSEC aka Operational Security is critical for a hidden gun or disguised safe. If you start showing and telling friends, then they are bound to talk about it, because a Mossberg in a coffee table is cool. The more people who know, the more likely it’ll reach the ears of less honest people. Does the supposedly hidden safe stand out? Is there something that makes your concealed gun safe look just a bit too bulky? Are the times for the hidden compartment just a little obvious? Is your clock handgun safe actually set and on display? Consider these things. Do you buy a hidden gun safe from a company that couldn’t help but stamps their logo on it? Something like “Bob’s Concealment Safes” is probably something to avoid. The same goes for any logos featuring guns, knives, or the word tactical. Throw in a flashlight, extra ammunition and magazines, and other accessories you may need in a violent situation. Have tons of ammo cans, accessories, boxes with gun company logos, etc. around your house? These are good ways to let thieves know you have guns, and if they can’t find a safe they may get suspicious. So stash the rest of your stuff well. Now comes the part where I tell you all about my favorite hidden guns safes. I’m choosing these based on a few different factors because I don’t have experience with every item. I have, however, at least seen and interacted in person with all of them at trade shows like SHOT, NRA, etc. I’ve chosen them based on looks, function, and quality. Most importantly, I chose them for their ability to actually hide something and the concept they use to hide your firearms. The 1450M by Tactical Walls, a full-length concealment mirror, is my all-time favorite hidden gun safe. It makes me feel like a secret agent. This whole system is recessed into your wall, so installation isn’t the easiest thing. However, it’s like the Predator of hiding guns. It blends in seamlessly and is large enough to fit a long gun, handguns, extra ammo, even a soft armor vest. It’s got lots of room, with the main compartment being 14’’W x 40”Hx3.5” D the smaller being 14″W x 10″H x 3.5″D. You have two options for locks, a traditional lock, and key or an RFID device. You can add magnets on the inside with the Tactical Walls magnet pack to make sure everything stays secure. These also allow you to store more goods by making the space more efficient. Liberty Home Concealment also has their own version of the mirror safe. We’re testing this out right now and so far it seems solid. Made of solid wood, it’s a good, more affordable alternative to Tactical Wall’s mirror safe. What we love about it you can opt for it to be unfinished so you can paint it any color you want yourself! As for the lock, you can pay a bit more ($375) for the magnetic lock version. This is necessary for anyone with kids at home. I’ve had one of these for a few years now, originally given as a gift. It’s the most affordable option on this list, and also the smallest. There are even several different types of gun clocks made in different shapes but they all do basically the same thing. They look like a clock and they hide a gun. Pretty simple, right? They are small of course and don’t look fancy enough to be expensive. The doors on them are seamless and blend well. Most can hold a full-sized handgun like a 1911, Glock 17, or 4-inch barreled revolver. Mine sits in the living room, out of the way, and in the shadows of some shelves. A gun clock is an easy and affordable means for a shooter to stash a gun on a budget. We’re also testing this one made by Liberty Home Concealment. Made of solid wood and is much better looking than the Gun Clock above (in my opinion), this clock safe comes with many different finishes. You can also get it unfinished and paint it yourself! The Covert Cabinets Wall Shelf is likely the most concealed option on the list. Even the most thoughtful crook or paranoid thief is not going to think a shelf conceals a gun. The Covert Cabinets Wall Shelf is a simple, and small shelf has a compartment that opens at the bottom of the shelf. It blends in perfectly and is really difficult to spot if you’ve never seen one before. The hinges operate with a dampener gas spring which opens the compartment in a controlled manner. This keeps everything in place instead of sending it spiraling out when opened. The compartment is small, so you are limited to a handgun. The internals is 13.5 inches long by 8 inches wide and a 1.75 inches deep. You could store multiple full-sized handguns, or a handgun, extra mags, flashlights, etc. It also has a load limit of 20 pounds so you can also stack some stuff on top without worry. A few books or pictures really help you camouflage those hidden guns. I really miss my Gunvault SpeedVault, but it, unfortunately, got left behind with the massive desk in my last home. The SpeedVault isn’t like the camouflage gun safes on this list. Rather, it’s a simple safe designed to be hidden under a desk, table, etc. It holds a single handgun and is quite compact. The SpeedVaulthass a simple drop-down drawer to present the weapon and ensure that it’s easy and quick to draw. It uses a simple push-button combination to open, or you can use the key override. The SpeedVault has a built-in courtesy light so that even in the dark you can see and draw your gun. The SpeedVault is filled with foam that protects your weapon and keeps it from being scratched, dinged, and abused. The SpeedVault is absolutely perfect for the home office and can fit in most nightstands. What’s your take? It’s very likely you’re already tucked away in bed when you hear a thump in the night. Stealth Defense’s Under-Bed Safe has got you covered. Decently heavy at 74 lbs with 14 gauge thick steel and also one of the few under-bed safes that illuminate when you type in your combo. So get ready to drop down behind the cover of your bed, type in your combo, and be ready for anything. See more under-bed gun safes at Secret Storages. The Concealment Coffee Table is a large option that makes stashing guns simple. It gives you access to an arsenal in what’s likely the center of your home. The big 37.5-inch long internal compartment is long enough for a 16-inch carbine AR 15, AK, or a short barreled shotgun. The same compartment is 11 ¾ inches wide so you can also shove in extra magazines, a few handguns, and more. The compartment drops down from the bottom in a controlled manner. You use an RFID key in front of the table and it opens without issue, giving you immediate access to your arsenal. The biggest downside is the hefty price tag. Hidden gun safes are pretty cool, and the market is expanding every year. Some of the displays at Shot Show were amazing. As the market grows I’m excited to see what will come out next. What about you? Thanks for the great article. 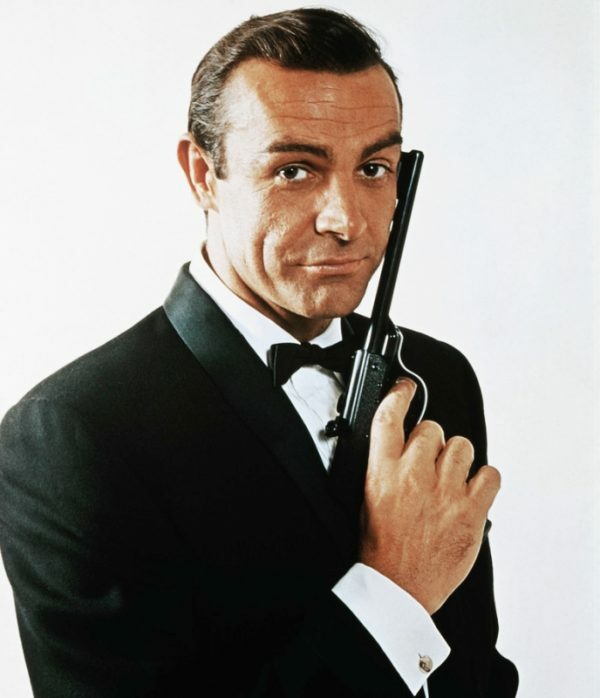 I especially like the James Bond photo, holding a .177 cal pellet pistol. I’ve got one identical to that. It wouldn’t be my first choice for home defense, but does look cool. Thanks Travis for the great article! I get overwhelmed looking at options for safes and this article makes me think outside of the box for options.